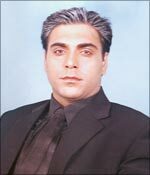 Like most actors, Ram Kapoor too struggled in his early days. From theatre to television to movies and then back to television again, he has been there and done that. Now, he is one of the top actors in television thanks to Kasamh Se, the hit TV serial produced by Ekta Kapoor. He even bagged the Best Actor award for his role as Jai Walia in all the three award functions this year -- Indian Telly Awards (ITA), Hero Honda Indian Television Award (HHITA) and Sansui Television Awards. What's more, he and his co-star Prachi Desai (Bani) won the Indian Telly Awards 2006 for best couple. From his first serial Nyay to Ghar Ek Mandir and finally Kasamh Se, the actor has really come a long way. In this interview, the actor talks to Rajul Hegde about Kasamh Se and how the birth of his daughter has changed him. How does it feel to win the Jury Best Actor Award at the 2007 Sansui Television Awards? It felt very good. It turned out to be a very special night for me. This was the third award function that I won an award and I felt all the better when Kasamh Se got the Best Serial Award too. The serial has got me lot of recognition and appreciation. I didn't expect this character Jai Walia to do so well. This is the highlight of my career. Did you always want to be an actor? How did you get into television? Though I studied in Sherwood, Nainital, which is known for football and theatre, I was good in neither. Prominent theater personality Amir Raza Hussain used to come from Delhi to direct plays. When I was in ninth standard, I had a fight with the head boy. As a punishment he sent me for an audition. I was selected for a play. I did five performances and people appreciated them. Later, I learnt that he selected me not for my acting skills but for my voice and diction. I did a lot of plays in college and wanted to pursue a career in acting. So I decided to first go abroad and study acting. I choose Stanislovsky School of Method Acting in America because method actors have always inspired me. When I applied for the first time, I was rejected. I tried again and in the second year I got in. I then graduated from acting school and came to India. What is method acting and how has it helped you? Method acting is mental acting. The whole concept of method acting is acting through your senses -- feeling everything. I believe acting is an art form and needs to be studied. Method acting gave me confidence, nullified my weakness and highlighted my strength. What were you doing before you joined television? I did theatre when I was in school and college. After doing an acting course for six months, I started working for television. How have you evolved as an actor since the days of Nyay and Ghar Ek Mandir? My confidence is much higher now than what it was earlier. My speed and efficiency has also increased. Kasamh Se is one of the most popular serials today. Who do you credit the success of the serial to? I cannot take the credit for the success of the serial alone. It is a team effort. How has your life changed after Kasamh Se? What do you like about your character Jai Walia? Do you identify with him? What's not to like about his character? He is rich, good looking, powerful and has a good heart -- an awesome person. I always felt that TV is a woman's medium whereas films are a man's medium. So, I feel lucky that in a women oriented medium, I get to play such a strong character. As for identifying with the character, I'd say that Jai Walia is regimented and has a temper whereas Ram Kapoor only has a temper when a person doesn't know his job. But otherwise, I am easy going and take life as it comes. Which TV serial, besides, Kasamh Se, do you watch? I have no time for television. Normally, I don't watch Hindi serials. I'm more into Animal Planet, National Geographic and Discovery. I also love to watch movies. How do you rate yourself as an actor? I do not consider myself very versatile. I have a lot to learn and want to keep growing. My first paying job was Nyay. I had done odd jobs when I was studying in the US. If you get offers from other production houses, will you accept it or be loyal only to Balaji? I want to concentrate only on one project at a time. As long I'm working for Kasamh Se, I will not think of any other serial. If Balaji offers me any other serial after Kasamh Se, I will definitely consider it because I have already worked with them. I never plan my future. You have a daughter Sia. How do you feel being a father? It is the best feeling. It has changed me tremendously and continues to do so. How do you balance between you work and family? Luckily, I have a supportive family. I do not manage my family and work very well. I take a backseat. Anybody who is reasonably doing well in their field has to face this problem. How hectic is the life of a TV star? I work a minimum of 12 hours and sometimes 18. This is the worst aspect of a TV actor's life. You cannot do anything. Television is demanding with no room for a social life. But I'm enjoying it. I used to play tennis and snooker when I was growing up. Now, work is my hobby. I am a Hollywood buff and watch a lot of movies. I just go home, shower and spend time with my daughter. Any plans to join Bollywood? As I said earlier, I have no plans for the future. TV has been good to me. I am lucky to be at the top. I am doing the best character on TV. I will not leave television easily. I may consider films if it is something really good. But right now, I am happy doing television.